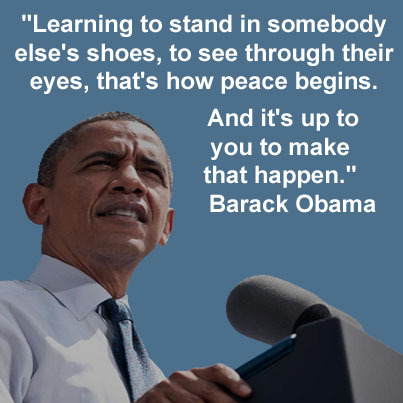 "Learning to stand in somebody else's shoes, to see through their eyes, that's how peace begins. And it's up to you to make that happen." "But it will depend on young people like you being open to new ideas and new possibilities. And it will require young people like you never to stereotype or assume the worst about other people. In the Muslim world, this notion that somehow everything is the fault of the Israelis lacks balance -- because there's two sides to every question. That doesn't mean that sometimes one side has done something wrong and should not be condemned. But it does mean there's always two sides to an issue. I say the same thing to my Jewish friends, which is you have to see the perspective of the Palestinians. 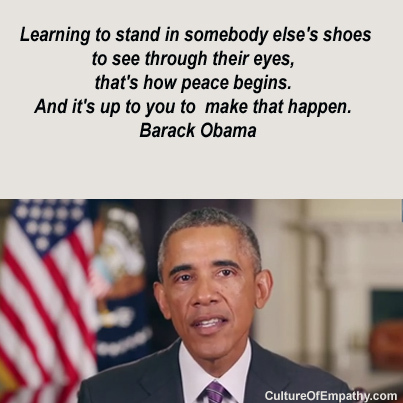 Learning to stand in somebody else's shoes to see through their eyes, that's how peace begins. And it's up to you to make that happen." "we remember those who are less fortunate, .... and at this sacred time of year let us join together across denominations, religions and cultures to make a habit of empathy and reach out to those most in need. 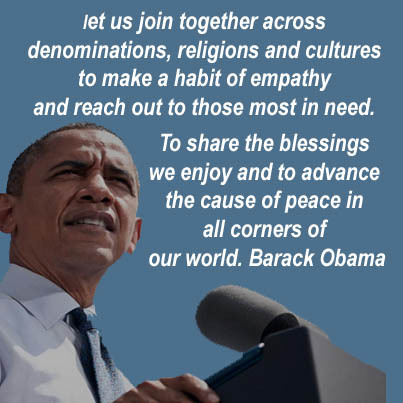 To share the blessings we enjoy and to advance the cause of peace in all corners of our world." "each side has legitimate aspirations - and that’s part of what makes peace so hard. And the deadlock will only be broken when each side learns to stand in the other’s shoes; each side can see the world through the other’s eyes. That’s what we should be encouraging. That’s what we should be promoting." 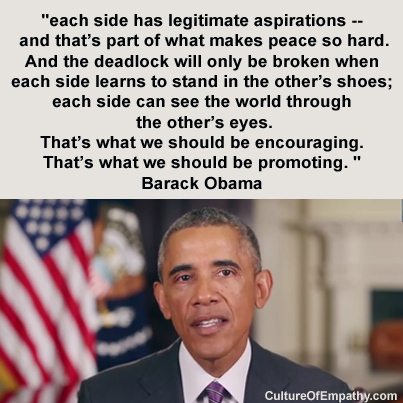 "each side has legitimate aspirations -- and that’s part of what makes peace so hard. And the deadlock will only be broken when each side learns to stand in the other’s shoes; each side can see the world through the other’s eyes. That’s what we should be encouraging. That’s what we should be promoting. This body -- founded, as it was, out of the ashes of war and genocide, dedicated, as it is, to the dignity of every single person -- must recognize the reality that is lived by both the Palestinians and the Israelis. The measure of our actions must always be whether they advance the right of Israeli and Palestinian children to live lives of peace and security and dignity and opportunity. And we will only succeed in that effort if we can encourage the parties to sit down, to listen to each other, and to understand each other’s hopes and each other’s fears. " "As you travel through the Middle East what keeps on striking home to me is how similar everyone is, and yet the degree to which we can find differences to fight wars over. It requires a great deal of empathy, I think, between various sides to overcome this history and live in peace." "Ultimately, peace is just not about politics. 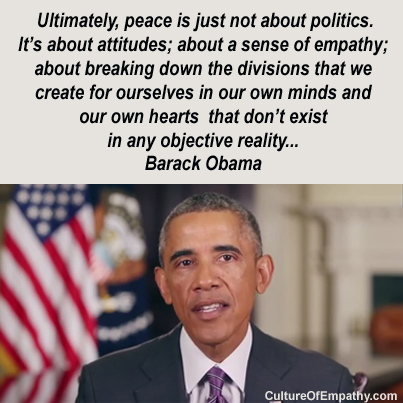 It’s about attitudes; about a sense of empathy; about breaking down the divisions that we create for ourselves in our own minds and our own hearts that don’t exist in any objective reality..."
"Ultimately, peace is just not about politics. It’s about attitudes; about a sense of empathy; about breaking down the divisions that we create for ourselves in our own minds and our own hearts that don’t exist in any objective reality, but that we carry with us generation after generation. And I know, because America, we, too, have had to work hard over the decades, slowly, gradually, sometimes painfully, in fits and starts, to keep perfecting our union." 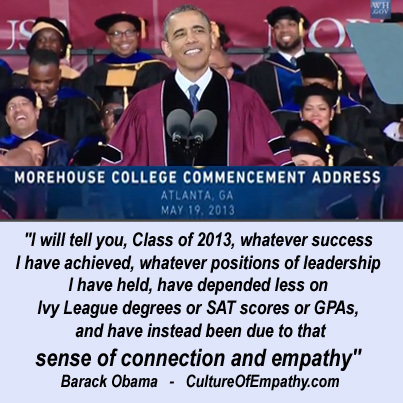 "I will tell you, Class of 2013, whatever success I have achieved, whatever positions of leadership I have held have depended less on Ivy League degrees or SAT scores or GPAs, and have instead been due to that sense of connection and empathy... "
And I will tell you, Class of 2013, whatever success I have achieved, whatever positions of leadership I have held have depended less on Ivy League degrees or SAT scores or GPAs, and have instead been due to that sense of connection and empathy -- the special obligation I felt, as a black man like you, to help those who need it most, people who didn’t have the opportunities that I had -- because there but for the grace of God, go I -- I might have been in their shoes. I might have been in prison. I might have been unemployed. I might not have been able to support a family. And that motivates me. So it’s up to you to widen your circle of concern -- to care about justice for everybody, white, black and brown. Everybody. 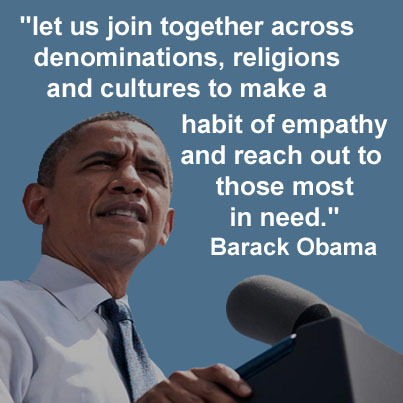 "let us join together across denominations, religions and cultures to make a habit of empathy and reach out to those most in need. To share the blessings we enjoy and to advance the cause of peace in all corners of our world." "We live in a culture that discourages empathy. A culture that too often tells us our principle goal in life is to be rich, thin, young, famous, safe, and entertained. A culture where those in power too often encourage these selfish impulses." "The world doesn't just revolve around you. There's a lot of talk in this country about the federal deficit. 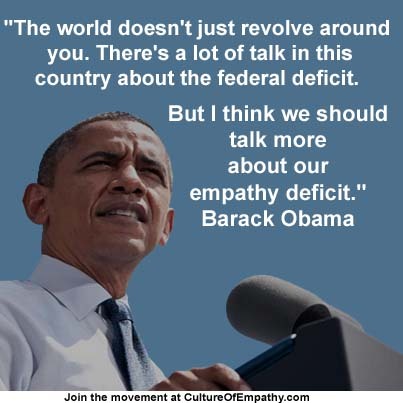 But I think we should talk more about our empathy deficit." "One of the values that I think men in particular have to pass on is the value of empathy. Not sympathy, empathy. And what that means is standing in somebody else's shoes, being able to look through their eyes." One of the values that I think men in particular have to pass on is the value of empathy. Not sympathy, empathy. And what that means is standing in somebody else's shoes, being able to look through their eyes. You know, sometimes we get so caught up in "us" that it's hard to see that there are other people and that your behavior has an impact on them. And sometimes brothers in particular don't like to feel empathy, don't like to think in terms of "How does this affect other people?" because we think that's being soft. There's a culture in our society that says we can't show weakness and we can't, therefore, show kindness. That we can't be considerate because sometimes that makes us look weak. 2005-06-22 - What it takes be full-grown man? 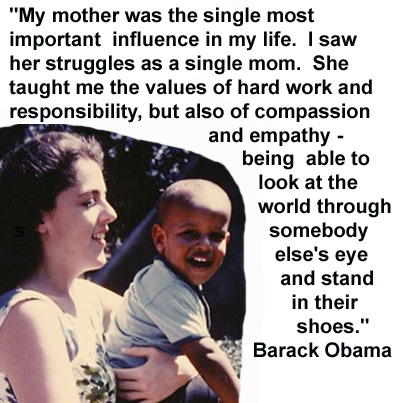 "We need somebody who's got the heart, the empathy, to recognize what it's like to be a young teenage mom. 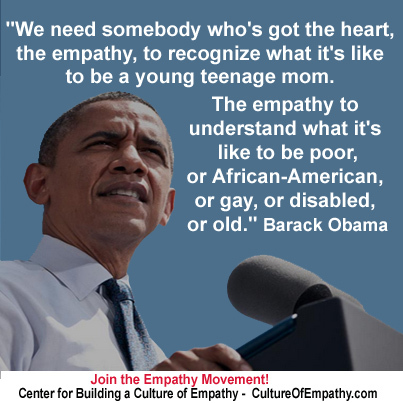 The empathy to understand what it's like to be poor, or African-American, or gay, or disabled, or old. And that's the criteria by which I'm going to be selecting my judges." "An empathy shortage. 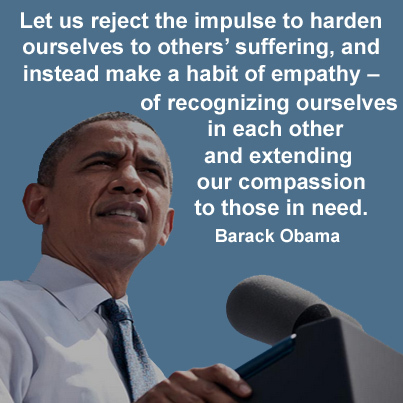 That's what the principle of empathy does, its calls us all to task. The heartless conservative, the patronizing liberal, the powerful and the powerless. The oppressed and the oppressor. 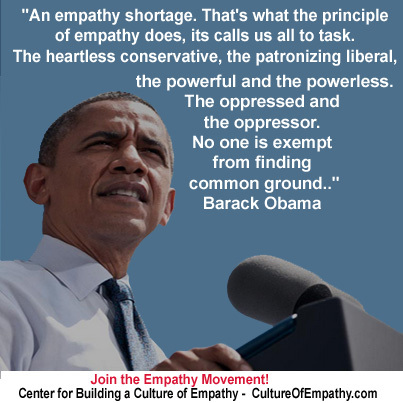 No one is exempt from finding common ground,"
An empathy shortage. That's what the principle of empathy does, its calls us all to task. The heartless conservative, the patronizing liberal, the powerful and the powerless. The oppressed and the oppressor. No one is exempt from finding common ground, because when no one is exempt it forces all of us to examine our own actions, our own belief systems. It shakes us out of our complacency and protects us from our own blindness our own self-righteousness. Our own fanaticism." "Let us resist prejudice, intolerance, and indifference in whatever forms they may take -- let us stand up strongly to the scourge of anti-Semitism, which is still prevalent in far too many corners of our world. " "At the dawn of this New Year, let us rededicate ourselves to that work. Let us reject the impulse to harden ourselves to others’ suffering, and instead make a habit of empathy –of recognizing ourselves in each other and extending our compassion to those in need. Let us resist prejudice, intolerance, and indifference in whatever forms they may take -- let us stand up strongly to the scourge of anti-Semitism, which is still prevalent in far too many corners of our world. " 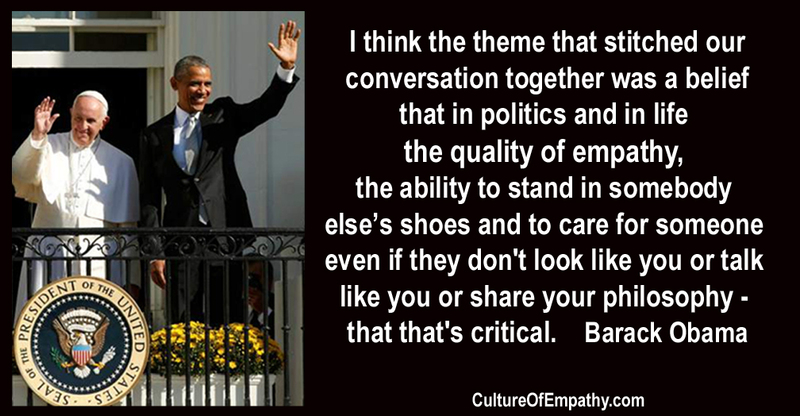 "That's part of the empathy. Empathy doesn't just extend to cute little kids. You have to have empathy when you're talking to some guy who doesn't like black people." Oprah: We Americans also suffer from an empathy deficit, because we often feel that the woman in Bosnia or Afghanistan who loses her child is somehow different from us. Barack: Those slash-and-burn tactics have become the custom in Washington politics. But we will not play that game. People don't want to hear folks shouting at each other and trying to score political points. They want to solve problems. I'm determined to disagree with people without being disagreeable. 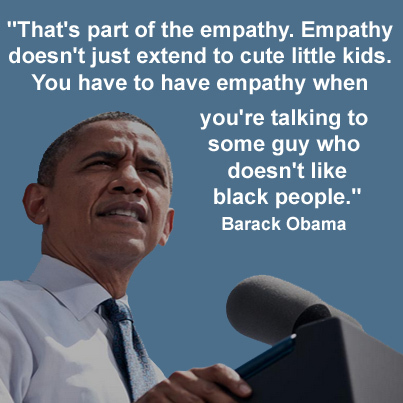 That's part of the empathy. Empathy doesn't just extend to cute little kids. You have to have empathy when you're talking to some guy who doesn't like black people. There's a level of viciousness in politics because power is at stake. Fortunately, most of my past mistakes are ones that people already know about. That's one of the nice things about writing a book. 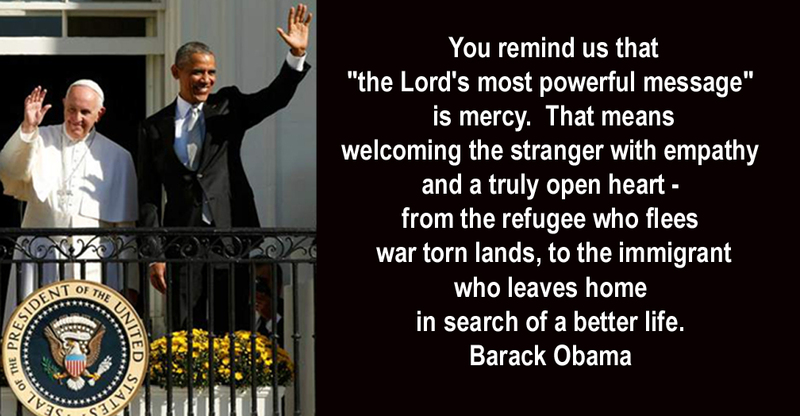 "You remind us that “the Lord’s most powerful message” is mercy. And that means welcoming the stranger with empathy and a truly open heart – from the refugee who flees war-torn lands to the immigrant who leaves home in search of a better life. " "I think the theme that stitched our conversation together was a belief that in politics and in life the quality of empathy, the ability to stand in somebody else’s shoes and to care for someone even if they don't look like you or talk like you or share your philosophy - that that's critical." I think the theme that stitched our conversation together was a belief that in politics and in life the quality of empathy, the ability to stand in somebody else’s shoes and to care for someone even if they don't look like you or talk like you or share your philosophy -- that that's critical. It’s the lack of empathy that makes it very easy for us to plunge into wars. It's the lack of empathy that allows us to ignore the homeless on the streets. And obviously central to my Christian faith is a belief in treating others as I’d have them treat me. And what’s I think created so much love and excitement for His Holiness has been that he seems to live this, and shows that joy continuously.